Hawthorn played its last senior home game at Glenferrie Oval on 1 September 1973, defeating South Melbourne by 37 points: 16.20 (116) to 11.13 (79). Michael Moncrief kicked seven goals and Leigh Matthews three. The boundary-fence scoreboard on the railway-line side of the ground was still there on March 2 2006 for a legends game between teams led by Chris Langford and John Platten. (Langford’s team won.) The game celebrated 100 years of the Hawthorn Football Club at Glenferrie, as well as marking the move to Waverley Park. 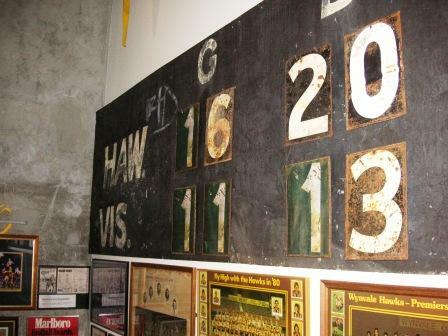 Shortly after the legends game Hawthorn’s club historian and museum curator Peter Haby made sure the scoreboard didn’t disappear, like some other relics from Glenferrie Oval. He had the scoreboard moved out to the Hawks’ new headquarters at Waverley Park, where it sat in the carpark basement for about four years. 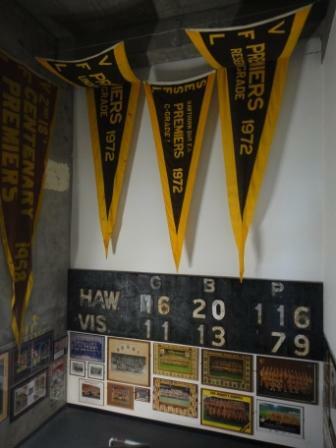 The scoreboard is now part of the Hawks museum, situated in a stairwell, surrounded by flags and photos. Peter noted that the ‘1’ numbers are not original. 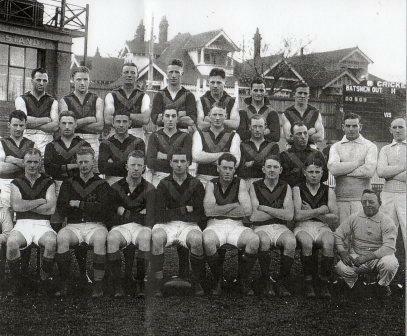 This 1929 team photo shows a cricket scoreboard. It’s quite likely the scoreboard may have been adapted for football games. Glenferrie Oval had three or four scoreboards over the years. 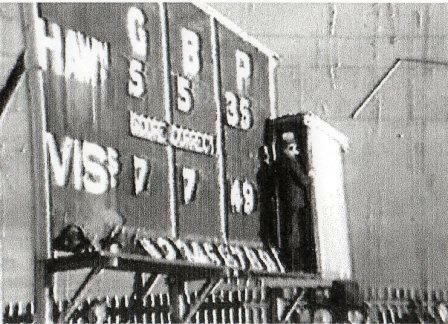 Back in the 1930s was a scoreboard with a simple reassuring message: ‘score correct’. 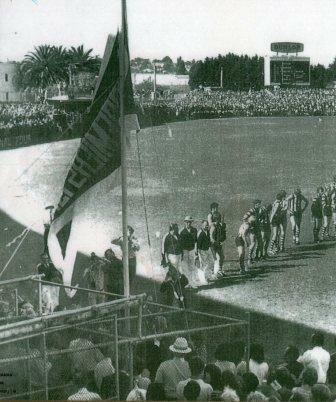 In later decades there was a Dunlop scoreboard on the Linda Crescent side of the ground, seen here in the background at the unfurling of Hawthorn’s 1971 flag, at the first home game of 1972. In the foreground you’ll find a famous foursome: D.Parkin, L.Matthews, P.Crimmins and P. Hudson, alongside some other pretty handy players: Hendrie, Meagher, Stevenson, Martello, etc. 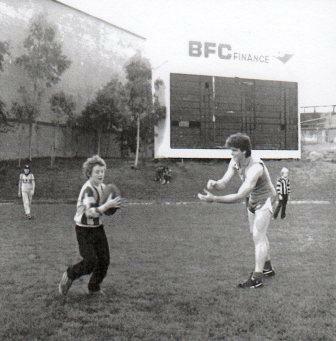 Gary Ayres handballs to a young Hawks fan during a pre-season clinic in March 1984. By the 1980s the scoreboard had changed sponsors and changed sides of the ground. The ground hosted reserves and Under 19 games until the early 1980s. There are no official remnants of the larger Glenferrie Oval scoreboards but thanks to Peter Haby’s foresight there is still the boundary-fence scoreboard, set in stone in a Waverley Park stairwell. 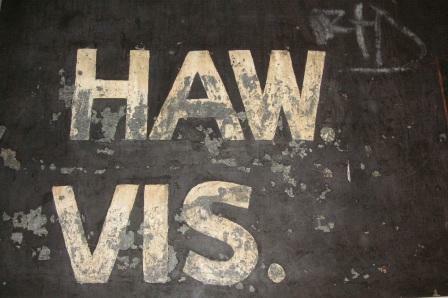 The photo of the scoreboard with “Haw” and “Vis” with the sentry box for the attendant to shelter from the rain, illustrates that for many years during the old VFL, some grounds has seperate Boards for the Home Team Scores,and the Scores from other grounds with Race Results etc. I also have a question as to why the old VFL showed other games scores as 3.5 (goals,behinds), whereas the old VFA just showed the number of points. (23). Anybody have any idea why this was so? Graeme. (Joint Scoreboard Operator at Camberwell VFA 1984 to 1990). Thanks for your insights, Graeme. There is evidence of separate boards in a 1949 photo from The Argus. It’s a team photo of Williamstown before a finals game, so I’m guessing the photo might have been taken at the Junction Oval. I’ll put the photo up on this site in a week or two. I miss scores from around the ground! The VFA and VFL were always a little different! 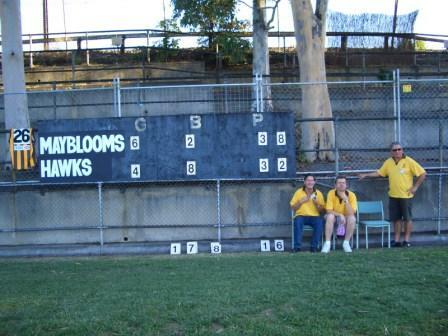 I was at the last match at Glenferrie between the Hawks and the Mayblooms, and remember being chuffed that the old scoreboard was being used. Glad to hear it’s not been turfed out! In the between season’s break 1973-4 highly respected Ivan Moore resigned as club secretary to go into a newsagency business. Ivan nominated me to take over. There were two other candidates, Bob Moore and John Quinn – as recorded in the minutes of the first committee meeting January 1974. It was a busy time for a new secretary as from the upcoming 1974 season, the club was to play its home games at Princes Park sharing with Carlton. John Quinn was nominated by the incumbent president Phil Ryan who was on the Board of NM Insurance, Quinn being on his staff. Quinn landed the full-time position. Quinn lasting only about six months in the job, he simply wasn’t a football person. After Quinn’s departure Bob and I were contacted urgently with a question put to us if one could fill the position? I was headed overseas in my work and declined, Bob, a club stalwart was quite happy to take over, the administration remained based at Glenferrie. There is some unfortunate history in the premiership of 1976. Poor Bob overlooked a sizeable block of unsold grand final tickets in a safe to be returned to the AFL for selling to the general public. He had left this whole block of prime seat tickets situated in the Southern Stand near bay 13. The rather huge block of vacant seats running from the boundary line fence back to the standing room only area stood out like a sore toe as the MCG filled. After realisation of this unfortunate situation, just before the opening bounce, standing only patrons were soon invited to fill the vacant seats. Needless to say that Bob retired from the secretary position not long after.